Sarah Hall is an honorary fellow of Aberystwyth University, and a fellow of the Civitella Ranieri Foundation (2007). She has judged a number of prestigious literary awards and prizes. She tutors for the Faber Academy, The Guardian, the Arvon Foundation, and has taught creative writing in a variety of establishments in the UK and abroad. Sarah currently lives in Norwich, Norfolk. Her third novel, The Carhullan Army, was published in 2007, and won the 2006/07 John Llewellyn Rhys Prize, the James Tiptree Jr. Award, a Lakeland Book of the Year prize, was shortlisted for the Arthur C. Clarke Award for science fiction, and long-listed for the Dublin IMPAC Award. The Carhullan Army was listed as one of The Times 100 Best Books of the Decade. Her fourth novel, How To Paint A Dead Man, was published in 2009 and was longlisted for the Man Booker prize and won the Portico Prize for Fiction 2010. Her work has been translated into more than a dozen languages. Her first collection of short stories, titled The Beautiful Indifference, was published by Faber & Faber in November 2011. 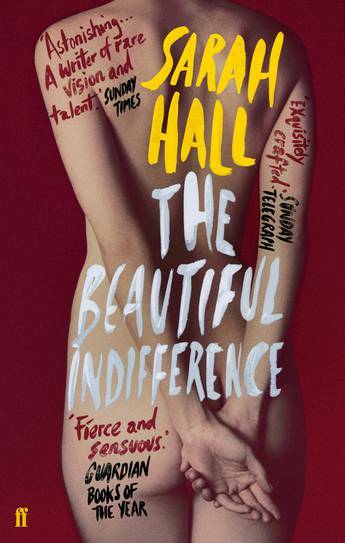 The Beautiful Indifference won the Portico Prize for Fiction 2012 and the Edge Hill short story prize, it was also short-listed for the Frank O'Connor Prize. A new collection of short stories by Booker-shortlisted author Sarah Hall.